Quintana Roo University archaeology professor Guillerno Ramirez gives the UBC Spanish Summer Field School an insight into ancient Mayan culture at the ruins in Kohunlich. On April 14, this sun aligns this fork-shaped stone to another stone on the opposite end of the plaza. A new Spanish Summer Field School has not only helped students from UBC's Okanagan campus build their capacity in Spanish, but showcased a side of Mexico not found in traditional tour guides. 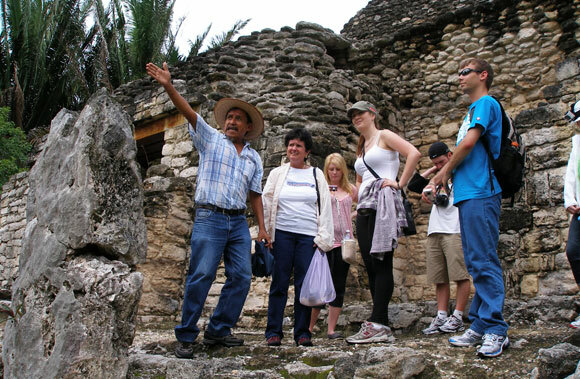 The three-week excursion, in partnership with Quintana Roo University (QRU) , provided an extraordinary experience as Canadian students toured historic ruins guided by an archaeology professor, visited a manatee enclosure closed to the general public and received a true taste of rural Mayan lifestyle. UBC student Cory Cheyne says the group's hosts from QRU went beyond the call of duty in making sure their field school experience had a value-added component. While in Chetumal, near the Belize border, the Canadians set out in the QRU bus to visit Mahahual in the Costa Maya, Bacalar (the lake of seven colours), the rural Mayan community of X-Hazil, and ancient ruins before wrapping up the excursion with three days in Playa del Carmen. The 21-day adventure was the second leg of the UBC/QRU Spanish Summer Field School, with the Okanagan campus playing host to 15 Mexican students last spring. While in Mexico, the Canadian students received a second-year UBC language course, Spanish 204, in a context which extended beyond the classroom walls. Experiences they encountered were transformed into assignments by Prof. Grisel Garcia Perez. On their first day in Chetumal, students visited a Wal-Mart and were asked to compare it with the one in Kelowna. Another assignment was to relate Bacalar, where the 1980 feature film Blue Lagoon was filmed, to Okanagan Lake. Being on the road in another country gave field school students a chance to connect with their professor on a level not possible in a traditional classroom setting in Canada. Student Patrick Murphy says each group dinner and other outings added new dimensions to the students' relationship with their professor. “We almost learn more from her out of class than in class,” says Murphy. “We respect her immensely and it’s because of her respect for us. We would do anything for her, anything she asks. Academically, everything has been great. The Spanish class proved to be flexible as long as the academic criteria were met. Aaron Wyle presented his oral exam in the departure area of the Cancun Airport. Another level of support came from Mexican students – or study buddies – who improved their English skills in Canada and returned the favour in Chetumal. Joanne Gabias took the opportunity to be a host to the Mexican students in Canada, and is grateful she did. Cali Fortin says her study buddies kept her Spanish immersion on track, even out of the classroom. The city of Chetumal, roughly the size of Kelowna, provided a safe environment for students and great value as well. On their final night in Chetumal, students were invited into the home of Mayan student Shirley Sosa for dinner. It was a humbling experience as guests were even provided small gifts.